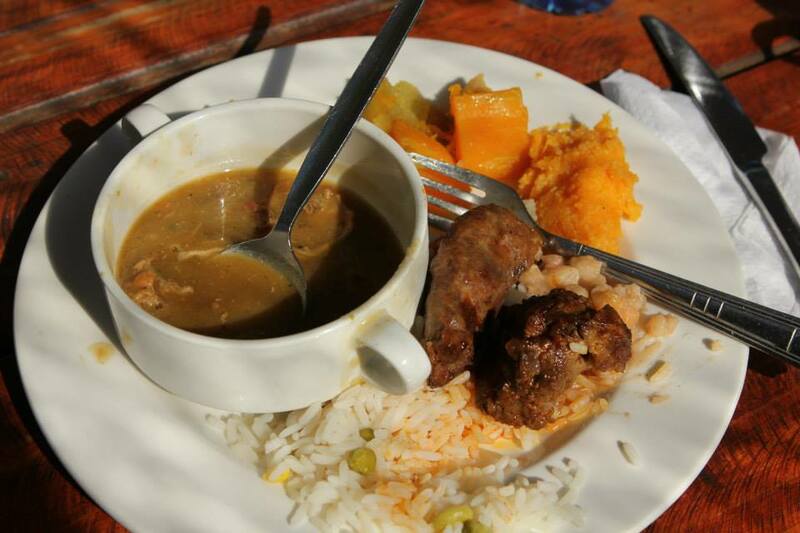 Delicious boerewors (sausage), pumpkin, and spicy soup for lunch in Soweto, South Africa. One of the things I love most about traveling is trying new food. There’s nothing quite like enjoying a regional delicacy while we’re on one of our adventures. Eating in a foreign country is part history lesson, part cultural experience, and sometimes an Indiana Jones style adventure (I’m thinking about the breakfasts we encountered in Japan). Some of my best memories of the last nine years of traveling are food related. Portuguese cookies, Irish stew, Italian pasta, German sausages… sometimes a cookbook is as good as a passport. When I get home from one of our adventures, I usually try to re-create some of my favorite recipes from the tour in my own kitchen. Sometimes it’s a great success. My kids loved the Peri-peri chicken I made from South African recipe. Other times it takes a few tries to get right – making Spanish Paella is an art I have not yet mastered, but I’m getting better with each try. Sometimes, however, its a complete mess – the Tiroler Gröstl we had in Vienna, Austria is a meal I still dream about, but when I tried to make it at home, well… I think I gave my whole family food poisoning. This year, a number of our students have taken it upon themselves to try their hand at French cooking before we even leave the U.S.A. I can’t wait to see how they think their own culinary skills stack up to what we experience in Paris in a few months, and I’m even more excited to be invited to their houses for dinner after they’ve learned all about French Cuisine this summer in Europe. This first video is McKenna T’s recipe for macaroons. Now, I’ve had macaroons. Real macaroons. Right from the bakery in Paris macaroons. And, as someone who firmly believes that macaroons are the most delightful food in the entire universe (and fun to say), I have to say that McKenna’s macaroons look incredible. This is McKenna’s second trip with TAP, so she know shat she’s getting into, and I foresee many stops at the patisserie to stuff our faces with colorful cookie heaven. Another of my favorite foods in France is the crepe. I take the crepes very seriously. You can get them all over the place from food carts in the touristy areas of town, but those aren’t the best of the best. That’s the McDonald’s cheeseburger version of a crepe. Going to a real Creperie (a restaurant that specializes in crepes) is the way to go. First you order your meal – a darker, heavier crepe that isn’t sweet at all. It’s a savory crepe (actually called a galette). My favorites have been loaded with things like cheese, sausage, bacon, egg, chicken, onions… You get the idea. It’s nothing like an IHOP Rutti Tutti Fresh and Fruity. After you enjoy the savory crepe, you order the sweet crepe for desert – cream, ice cream, chocolate, salted caramel, toffee, fresh fruit… sweet crepes are loaded with fantastic dessert flavors. This video is Hannah J’s take on crepes. She does a phenomenal job at recreating sweet crepes that look just as good as anything I’ve had in Paris. I can’t wait til Hannah gets to compare her crepes with the Parisian originals. Finally, two of our adventurers, Jilli R and Joy P (along with their friend Kiana), tried their hand at making a real French soufflé. This video made me hungry, and sad. Hungry, because their soufflé looks amazing. Sad, because even though I’ve been to Paris several times, I’ve never ever had a soufflé. Looks like I’m going to be trying it out using Joy and Jilli’s tutorial. I love when the students preparing for one of our adventures take the time to try to get to know a culture before we even get on the plane, and for my money, food is the best way to do that. I encourage every one of our travelers to try out a foreign recipe or visit an ethnic restaurant before we go. Understanding a culture’s food is the best way to get to know what they’re all about. I can tell already that McKenna, Hannah, Jilli, and Joy are all going to have a fantastic time eating their way through Paris. If anyone else (students, parents, or teachers) from our France, Peru, or any of our past groups would like to try their hand at a cultural recipe and making a fun video, we’d love to share them. Give it a shot. I would love to get Makenna T’s tips on Macaron’s and her recipe that she uses!